Celtic Nativity Set. Comes in a Nice Keepsake box with the history of this style of Nativity. This is a 6 piece set in a gift box. These are 1 1/2 to 1 3/4 inch the Manger is 2 1/8 inch and the Baby is 1/2 inch tall. Material is a Poly stone resin mix. Celtic Nativity Set. Comes in a Nice Keepsake box with the history of this style of Nativity. 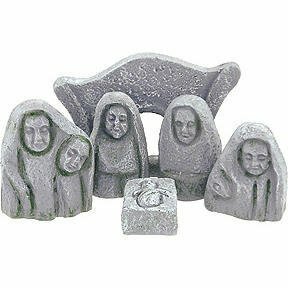 These are 1 1/2 to 1 3/4 inch the Manger is 2 1/8 inch and the Baby is 1/2 inch tall. Material is a Poly stone resin mix.